If you haven’t noticed already, I love love love this stuff. The coverage is pretty light when you first apply it. In fact, you can’t even really tell that you have it on. But then, something strange happens. As the moisturizer sets, the coverage gets a bit heavier. Now, I’m not saying that it is full coverage, but it helps to even out redness and cover zits that aren’t quite fully formed (you know the ones that aren’t super red). I find that it is the perfect amount of coverage for me. It lets my natural skin shine through, but it evens out the patchiness I have on my cheeks. When topped with concealer, my skin looks really good. The finish of this tinted moisturizer is exactly like skin. I’m not even kidding you. It doesn’t have a dewy finish, but it isn’t matte either. It looks like skin. Haha. I don’t know how else to describe this. 🙂 It is really pretty and looks very natural. I’ve mentioned before that I have combination skin, and that means that I can get a bit oily in certain places. I don’t feel that this product facilitates excess oil production. It certainly doesn’t prevent it, but it isn’t making the oily areas worse. Furthermore, I find that even if the moisturizer starts to fade in those areas, it does it in a way that doesn’t make my skin look blotchy. This is courtesy of the light coverage of the product. In terms of a moisturizer, it works amazingly well. It has helped with dry patches under my eyes. As a bonus, it doesn’t cling to dry patches in the way that a traditional foundation would. It simply smooths it out without drawing extra attention to it. I tried really hard to take a before/after shot for you, but the lighting in my flat is really strange, and I don’t get a lot of natural light in my room. You’ll just have to take my word for it. Let me know what your favorite tinted moisturizers are in the comments below. All opinions are my own. I bought this myself. I am not getting paid for this post. 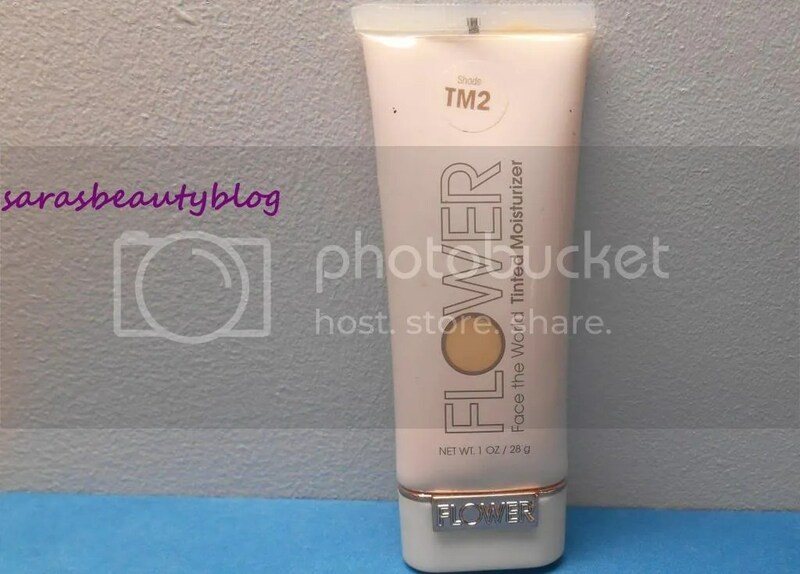 This entry was posted in Face, Foundation, Makeup and tagged base, face, face the world, flower, flower beauty, light coverage, photo, photos, review, reviews, tinted moisturizer, tm2, walmart. Bookmark the permalink. Been wondering about this stuff! Thanks. Okay I will! I’m hoping to get several flower products to test soon. Right now I use a weird combo or 2-3 bb creams, and a powder but it appears as light coverage…Lumene & Olay and then the Garnier BB as the spot concealer, and Revlon colorstay compact powder to set and fill in/erase pores. In case your’e curious b/c-I LOVE talking about makeup too! I’ll have to check those out once I get back to the States. I haven’t tried out any BB creams (except for the Physician’s Formula BB powder but I don’t think that counts. It’s just a powder). Oh! Where are you? How exciting. The Olay is very thin but a good base. I tend to mix and apply where needed since my skin is high maintance. I’m in England for a semester abroad! (That’s why I’ve been kind of absent lately. Essays and travel and such). I completely understand about high maintenance skin. Since being here, my skin has been even more picky than usual. Sigh. I am looking at & contemplating a semester abroad for fall 2014 or spring 2015. England is on the consideration list but most likely Ireland. Very cool of you! and love your stuff. Thanks very much I might actually do that! Going through some of the programs between multiple schools is a little overwhelming. Right now I’m just looking at Cortland & New Paltz. Loved your Birchbox post today. I have not tried a sub. cosmetics ect yet but I did Nature Box for a while and getting the package in the mail gave me a weird high. Yeah, it can be very stressful. I know that all the pre-departure stuff I had to do was insanely stressful. But it is definitely worth it. Thanks! I know how you feel! I love getting packages. I especially like it when I’m school in the States and I get to walk around campus, feeling all cool with my package. Hahahaha. Does TM2 have yellow/neutral undertones or pink undertones? Hey Vanna! So sorry I haven’t responded in so long. I would say that TM2 has a neutral-leaning-yellow undertone. I am a bit cooler toned, and I don’t think it looks weird on me. Hope that was helpful!